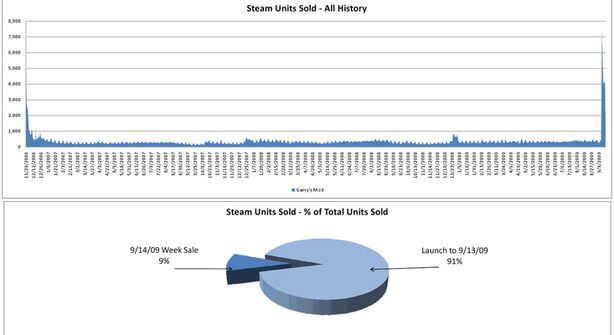 Valve are a company known for a lot of things, but letting the public see just how successful the Steam platform is for them isn't usually one of them - which is why it's interesting to see the sales data for Garry's Mod released. Originally a modification of the Source engine that turns the game into a virtual Lego set, Garry's Mod was released as a commercial product in November 2006. It was recently put on it's first discount sale run, with Valve slashing the price £5.99 GBP price in half for eight days. According to statistics released by the eponymous Garry, sales then spiked massively. 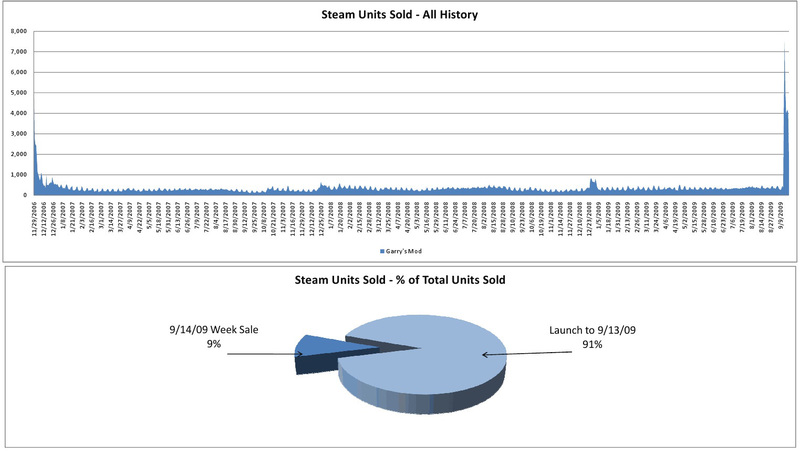 In the eight days before the sale Garry's Mod sold 2,975 copies. "Because it was 50 percent off, we kind of needed at least a 200 percent rise in sales for it to justifty itself.. The actual rise was 1074 percent," Garry said on his blog. Garry also revealed that the game sold more than 34,927 copies in that eight day sale period alone. Sales statistics show that that accounts for just shy of 10 percent of the mod's total sales. This isn't the first time that Steam sales have been shown to be so impressively successful. Valve's first Left 4 Dead half-price sale pushed sales up by 3000 percent and increased Steam registrations by 1600 percent, for example. One unnamed third party game increased sales by 36,000 percent in a single sale weekend. Have you played Garry's Mod yet? We very much recommend it, but you can let us know your thoughts in the forums and check out the sales chart for the game below.